An Air Force surveillance satellite and its United Launch Alliance Atlas 5 booster were joined together today as the duo targets a March 19 blastoff from Cape Canaveral. Fitting a payload atop a towering rocket is the sure sign a launch is right around the corner, and that milestone was achieved this morning at Complex 41. 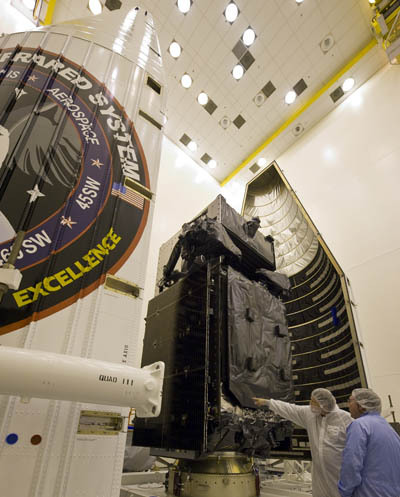 It is the second Space Based Infrared System Geosynchronous satellite, or SBIRS GEO 2, for the U.S. military's network of missile early-warning detection spacecraft. The SBIRS project is advancing the heritage capabilities of the aging Defense Support Program satellites from the Cold War focus on intercontinental ballistic missiles to today's short-range missile threats by incorporating new technologies to make quicker detections of fainter objects. Orbiting high above Earth, these spacecraft are designed as a "silent safety net" to spot hostile missiles launches that warfighters can take defensive measures against. The system determines the trajectory and where a missile is aiming to hit, giving the necessary alert to intercept the incoming weapon. The Pentagon calls SBIRS and missile-warning one of the nation's highest priority space programs. The Atlas 5 is scheduled for blastoff March 19 at 5:21 p.m. EDT (2121 GMT) at the opening of a 40-minute launch opportunity that extends to 6:01 p.m. EDT (2201 GMT). Firing on its RD-180 kerosene-fueled main engine, the 19-story rocket will head eastward from the Florida coastline en route to a standard geosynchronous transfer orbit to deploy the 10,000-pound payload. The bronze first stage, which gains an icy white coat during the countdown as supercold liquid oxygen gets loaded inside, will burn for four minutes before retro-thrusters assist in the separation event. The foam-covered Centaur upper stage then takes over, lighting its cryogenic RL10 engine to consume liquid hydrogen and liquid oxygen during a pair of burns that accelerate the payload into its desired drop off orbit. As soon as the first firing gets underway, the aluminum nose cone shrouding the satellite will be jettisoned in clamshell fashion, the two halves peeling away from the rocket. SBIRS GEO 2 arrived at the Cape in January to undergo final testing, the loading of maneuvering fuel and encapsulation within the nose cone at a processing facility cleanroom. The payload was hauled out the Vertical Integration Facility this morning and hoisted into the assembly building for mating to the Centaur. The shroud, known in Atlas parlance as the "large payload fairing" option for mission designers to select, is 14 feet in diameter and 39 feet tall. 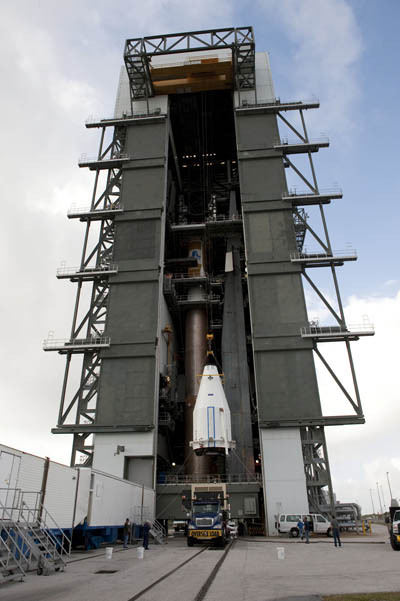 It gives the Atlas 5 an overall height of 189 feet for launch. Once Centaur is up and running and the fairing is separated, the upper stage performs an 11-minute initial burn that injects the vehicle into a preliminary parking orbit. A quiet coast phase lasts for 9 minutes over the equatorial Atlantic before the RL10 is restarted about 24 minutes into the flight. The second burn, running four minutes in length, boosts the payload into a highly elliptical orbit of 22,237 statute miles at its high point and 115 miles at its closest point to Earth and tilted 22 degrees to the equator. The rocket releases the satellite 43 minutes after launch, completing the third Atlas flight of the year and the fourth in the past four months. Built by Lockheed Martin, SBIRS GEO 2 will perform its own maneuvering into a circular geosynchronous orbit 22,300 miles above the planet for checkout and commissioning into the nation's missile-warning constellation.